The importance of gratitude to enhance our social and emotional wellbeing has gained momentum in the past decade as a topic of research in a number of fields. 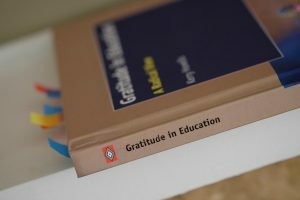 In this unit offered by the University of Tasmania you will critically reflect on the meaning and role of gratitude in education and its specific relevance to four main areas: teaching and learning; leadership; relationships; and wellbeing. Drawing on contemporary research in a number of fields, including positive psychology, you will be introduced to the theoretical and practical dimensions of gratitude as it relates to these areas and invited to engage in discussion as to its place in your context. You will be given then opportunity to reflect on your own gratitude, apply it to your learning of this unit and others you are studying, and to your teaching or leadership. An important aspect of this exploration is to critically examine the dilemmas and complexities of gratitude, as well as some of the cross-cultural differences. The unit gives teachers at all levels of education, from early childhood to university, as well as those working in the VET sector, an opportunity to strengthen their pedagogy through the theoretical and practical application of gratitude. » For more information see the University of Tasmania’s website.